We are hearing the word trauma a lot more nowadays. Gradually it is coming into general consciousness that trauma is something that has affected many of us and may be the underlying cause of a variety of physical and mental disorders. What is trauma and where does it come from? The definition of trauma is any experience that is overwhelming in the moment to the extent that it cannot be processed in the normal way. This overwhelming experience triggers the Fight-Flight-Freeze response. The memory and the crystallised Fight-Flight-Freeze response will be stored in the nervous system and can be activated later as a flashback or trigger response. What is overwhelming for a one year old is very different from what is overwhelming for an adult. As the brain develops and experience accumulates we are able to make sense of and process much more challenging events. Another factor which affects our capacity to deal with such events is whether or not there is any support available or recognition of the victim’s experience in the aftermath of the incident. Typically we think of trauma in terms of veterans returning from war, survivors of natural disasters or abusive behaviour in the home. These are all examples of trauma that is directly experienced by the individual. But how then do we explain the experiences of second-generation Holocaust survivors? Their parents may never have spoken of their experiences and yet researchers have detected physical impacts on their children – epigenetic changes leading to, for example, raised cortisol (stress) levels. It is now beginning to be recognised that trauma can be passed down the generations, with the impact of war in an earlier generation translating as alcoholism, violence or depression in subsequent generations. How does trauma impact us? 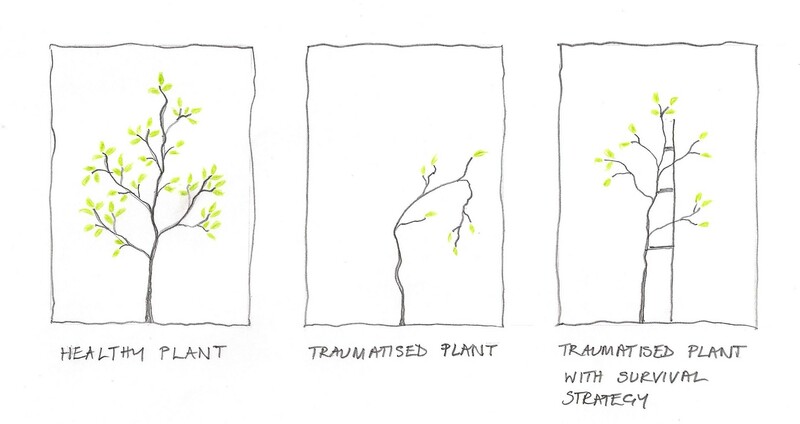 The trauma model developed by Franz Ruppert describes ‘splits in the soul’. The traumatic memory is stored in a split-off traumatised part, which is literally frozen in time; so that if the trauma happened when we were two years old, the traumatised part is a split off two-year old. Because it is split off, we may also lose access to other qualities – maybe our playfulness or zest for life. Following trauma, we still have a healthy adult part, but we also have a new part: what Ruppert calls ‘The Survivor.’ The Survivor encompasses a set of strategies to get us through life in the aftermath of trauma – it could be keeping quiet and unnoticed, it could be steely determination, it could be ingratiating friendliness. When we encounter these behaviours, something in us recognises that they are not fully authentic. We may feel this about ourselves – that we are wearing a mask, that we cannot really expose what we feel, there may be an underlying fear of not being accepted, of being ‘too much’. What this translates as is a fragmented sense of self. How can we recover from trauma? There are many methods, but essentially what is needed is to re-integrate the split-off parts. The main job of the survivor is actually to perpetuate the split – so that we don’t come into contact with the traumatic memory. One way our Survivor achieves this is to disassociate from what we are feeling and parts of the body can feel numb or lacking in sensation. It may be decades before we are ready to overcome the impulse to avoid looking at the trauma, but our soul’s innate impulse is to heal and reintegrate and when we are ready we will know. If we ignore the healing impulse, then often our body will produce symptoms that prompt us to slow down and re-examine our lives. For healing, the healthy adult part needs to make contact with the traumatised part. This witnessing allows the healthy adult part to grow and begins to re-integrate the traumatised part. As this happens, we begin to have less and less need of our Survivor and are able more and more to step into our authentic selves. Trauma therapy is still in its infancy, but there are already many methods that work on the nervous system, which stores the traumatic memories and the crystallised Fight-Flight-Freeze response. Some of these methods take the form of Process Work: working directly with unconscious material to allow us to shift old patterns. Shadow Work, Pesso Boyden and Family Constellations are examples of this kind of approach. In each of these techniques the body is used to access the unconscious material. Instead, or in addition to this, ongoing therapeutic work is often needed to provide regular support. Nowadays there are more and more therapeutic approaches which incorporate bodywork in some way. Somatic Experiencing, Cranial Sacral Therapy and EMDR are all examples of this approach. There is a different and complementary method of trauma healing which works directly on the epigenome, which is present in every cell in the body. The Amnanda Process removes traumatic memory at the cellular level and this can allow deep shifts to happen without re-encountering traumatic material. Some individuals will benefit from both these approaches – but not simultaneously! As well as therapeutic support, there are also a range of self-help practices such as yoga, 5 rhythms and TRE. Practices involving visualisation such as Yoga Nidra and Feeding Your Demons can be very helpful. The creative arts are also a great resource in the process of re-integration. And then there is the healing power of nature itself, which we can access through outdoor activities such as walking or gardening as well as contact with the animal world. From an Ayurvedic perspective, the impact of trauma creates a vata imbalance. Vata governs the nervous system and is involved in both the origin of trauma i.e the fight-flight-freeze response and in the symptoms of trauma such as hypervigilance, anxiety and insomnia. As therapeutic treatment for trauma often needs to be long-term, an Ayurvedic approach can be very helpful in managing the symptoms by pacifying vata. Oil treatments, such as massage, shirodhara and self-abhyanga are soothing, grounding and relaxing to the nervous system; helping to reduce symptoms such as anxiety and insomnia. Ayurvedic diet to pacify vata focuses on grounding foods such as root vegetables and kitcharee. Regular mealtimes and routines will also help to ground vata. Reducing stress and creating a healthy work-life balance is also an essential component of any long-term vata-balancing strategy. A key principle of the Ayurvedic approach to restoring balance is to ‘first remove the cause.’ Some of the therapeutic approaches listed above may be needed to help release the trauma that is stored in the body and to reintegrate split-off parts. The Amnanda Process is an Ayurvedic approach to healing trauma which uses the healing power of touch together with herbal oils and mantra. It is a series of twelve treatments which take place over the course of a year. Healing begins from the first treatment, and each person’s journey is highly individual but always includes renewed enthusiasm, greater clarity and direction in life and restored youthful vitality. If you want to find out how Ayurvedic lifestyle changes, treatments and herbs can transform your life, you can email me julie@simpleayurveda.co.uk. I would love to hear from you.